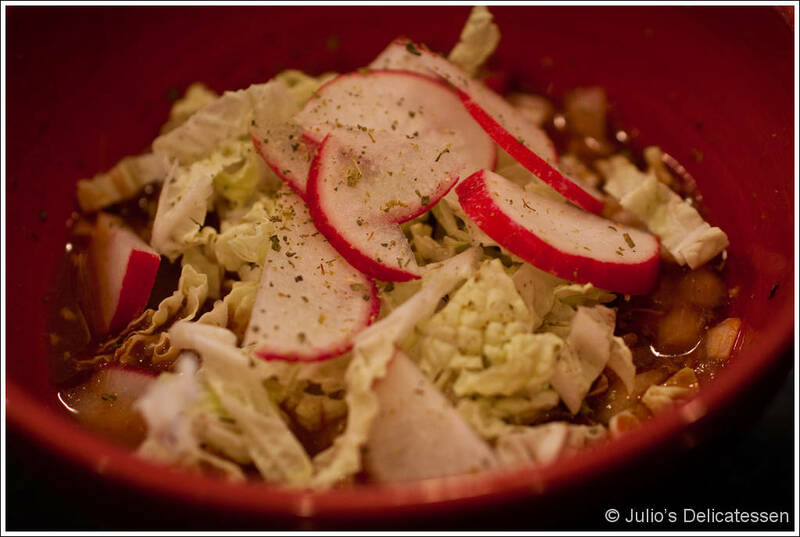 Pozole is a stew made primarily from nixtamal and pork. It is served in various parts of Mexico and the American Southwest. Even if you’ve never tasted this dish, you’ll recognize it as distinctly Mexican with dried red chile, tender pork, lime, and Mexican oregano providing most of the flavor. It’s also the perfect thing to serve during a football game on a cool autumn Sunday. Cook the corn – add 6 quarts of water to a large pot and add the garlic and corn. Bring to a boil, loosely cover the pot, and gently simmer until the corn is COMPLETELY tender. 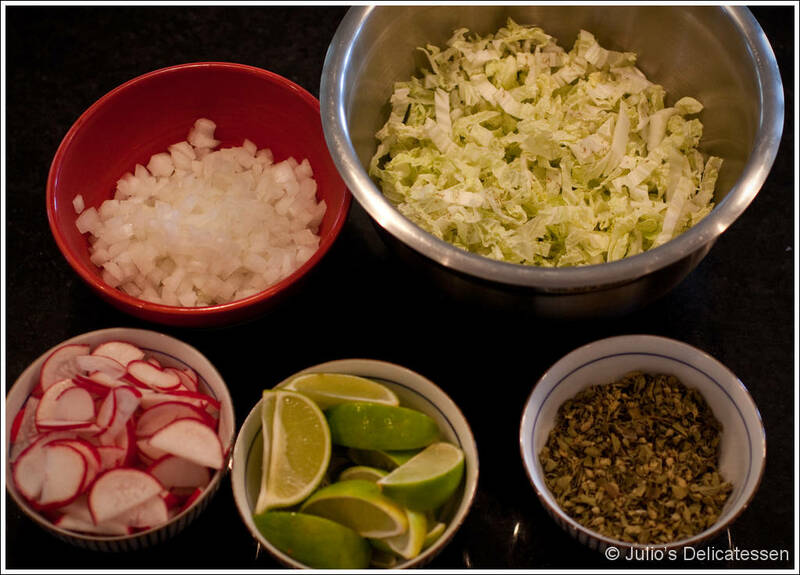 This will take around 3 hours for frozen nixtamal or 5+ hours for dried pozole corn. Add water if necessary to keep the water level constant. Cook the meat – this can be done while the corn is cooking or the day before. Place the pigs feet and pork shoulder into a large pot. Cover with 4 quarts of water and add 2 Tb of salt. Bring to a boil. Skim off the foam and discard. When the foam is mostly gone, add half of the onions. Partially cover the pot and simmer until the meat is COMPLETELY tender, about 2 hours. Allow the meat to cool in the broth to room temperature. When this is done, remove the meat from the broth, skim the fat off the top. You should have 2 quarts or so of broth. Shred the meat – remove the shoulder meat from the bones. Discard the bones and coarsely shred the meat. Remove the knuckles and bones from the feet and chop the meat into small pieces. Add the chopped feet to the shredded shoulder meat. If not using right away, cover the meat and broth separately and refrigerate. 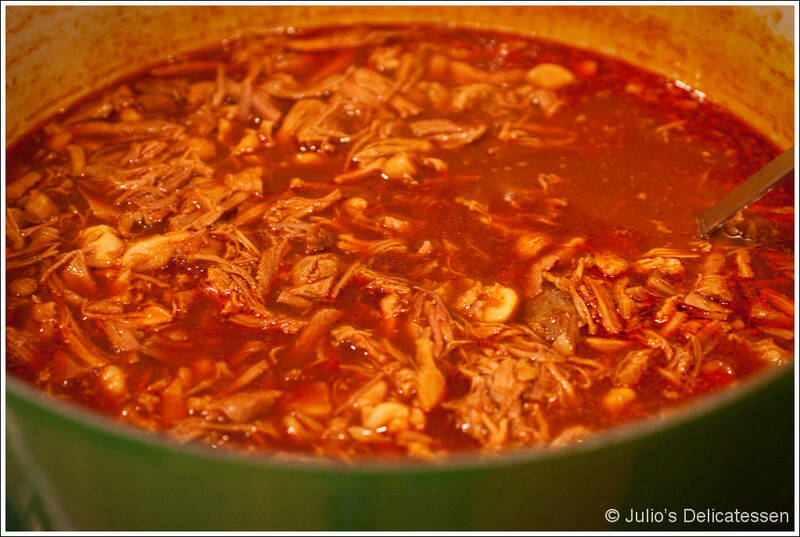 Season the broth – While the corn and meat are cooking, place the ancho chiles in a bowl of hot water. Place something (like a saucer) on top of them to keep them submerged. Allow to soak for 20 – 40 minutes. When thoroughly rehydrated, place the chiles and the liquid into a food processor or blender. Puree until as smooth as possible. When the corn is fully cooked, press the puree through a fine mesh strainer directly into the simmering broth. Add the pork broth at the same time and simmer for 1 hour. The above steps can be prepared as far as 3 days in advance of when you plan to serve. Serving – bring the soup to a very gentle simmer. While it is heating, prepare the garnishes. Place them in bowls or on plates near the stove with the simmering pot. When the soup comes to a simmer, add the pork. When it has warmed, stir and taste. Add salt if necessary. Also add water if required to achieve a hearty-but-soupy consistency.